Wasabi-No-Ginger is a fictional superhero appearing in American comic books published by Marvel Comics. Created by writer Chris Claremont and artist David Nakayama, he first appeared in Big Hero 6 #1 (September 2008), a book about a titular superhero team in which Wasabi is a member. The character was created by Chris Claremont and David Nakayama and first appeared in Big Hero 6 #1 (September 2008). He along with Fredzilla were meant to serve as replacements for then current members Sunpyre and Ebon Samurai. Wasabi-No-Ginger is a trained chef and a member of Big Hero 6. His first mission with the six was taking on a villain named Badgal and her three minions; Whiplash, Brute and Gunsmith. He is once again with his teammates, this time helping Spider-Man take out Doctor Octopus' satellites. Wasabi and Baymax jump head on into battle, taking on Everwraith. Wasabi-No-Ginger uses various swords to fight. He can also give form to his Qi-Energy, usually materializing it as throwing knives that can paralyze opponents. Wasabi-No-Ginger, renamed Wasabi, appears in the 2014 animated film Big Hero 6, voiced by Damon Wayans Jr.. In the film, the character is black, and is depicted as a smart, slightly neurotic, heavily built neat-freak and an expert on laser cutting at the San Fransokyo Institute of Technology. In addition, according to himself, his name is a nickname that Fred gave him after he spilled wasabi on his shirt one time. On the character, co-director Chris Williams said "He's actually the most conservative, cautious—he [sic] the most normal among a group of brazen characters. So he really grounds the movie in the second act and becomes, in a way, the voice of the audience and points out that what they're doing is crazy." Wasabi spends the majority of the movie following the rules and living almost in fear as he states, "There's a place for everything and everything's in its place." As the film progresses, he becomes slightly braver and learns to deal with the craziness of being a superhero. He appears to be the most protective of Hiro most likely due to his brotherly friendship with Tadashi. Wasabi wears a green armor suit that was built by Hiro that generates plasma blades from the wrists of the suit. Wasabi appears in Big Hero 6: The Series, with the character voiced by Khary Payton. In the first episode, "Baymax Returns", Wasabi's sudden change from pessimistic to courageous during battle is explained by the fact that he gets a high off of adrenaline. Despite his cowardly personality, he is shown to admire other blade related weaponry including ninja-chef Moamakase's despite her trying to use them against him. In "Fred's Bro-Tillion", Wasabi reveals that his father is an Orthodontist. In "Steamer's Revenge", it is revealed he is allergic to dogs. Out of all of his teammates, he has the least in common with Hiro whom he had difficulty with due to his messiness. By the end of "Killer App", the two become closer. Wasabi makes an appearance along with the rest of Big Hero 6 in Kingdom Hearts III, with Khary Payton reprising his role. ^ Juwono, Ben (director); Jenny Jaffe (writer) (August 18, 2018). "Fan Friction". Big Hero 6: The Series. Season 1. Episode 15. Disney XD. ^ Juwono, Ben (director); Paiman Kalayeh (writer) (September 22, 2018). "Steamer's Revenge". Big Hero 6: The Series. Season 1. Episode 19. Disney Channel. ^ "Disney Gives Marvel Fans First Look at Big Hero 6 Animated Film". IGN. 9 August 2013. Retrieved 9 August 2013. ^ a b Truitt, Brian (July 13, 2014). "Meet the saviors of San Fransokyo in 'Big Hero 6'". USA Today. Retrieved July 14, 2014. ^ Yamato, Jen (July 14, 2014). "Maya Rudolph, James Cromwell, More Join Disney's Marvel Animation 'Big Hero 6′". Deadline. Retrieved September 5, 2014. 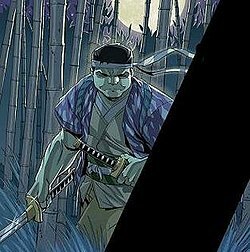 ^ "Wasabi" (PDF). xprizechallenge.org. Retrieved September 24, 2014. ^ "'Big Hero 6': Maya Rudolph & More Reprise Roles for Disney XD Animated Series". Deadline. November 3, 2016. Retrieved November 3, 2016. ^ Heneveld, Stephen and Ben Juwono (director); Sharon Flynn and Paiman Kalayen (writer) (November 20, 2017). "Baymax Returns". Big Hero 6: The Series. Season 1. Episode 1. Disney XD. ^ Good, Kathleen (director); Noelle Stevenson (writer) (June 10, 2018). "Food Fight". Big Hero 6: The Series. Season 1. Episode 5. Disney XD. ^ Heneveld, Stephen (director); Sharon Flynn (writer) (June 10, 2018). "Fred's Bro-Tillion". Big Hero 6: The Series. Season 1. Episode 4. Disney XD. ^ Juwono, Ben (director); Daniel Dominguez (writer) (July 21, 2018). "Killer App". Big Hero 6: The Series. Season 1. Episode 11. Disney XD. ^ Trumbore, David (September 10, 2018). "New 'Kingdom Hearts III' Trailer Calls in the Big (Hero 6) Guns". Collider. Retrieved September 10, 2018. This Marvel Comics superhero-related article is a stub. You can help Wikipedia by expanding it.